It is a common misconception that the only way to “get in shape” or “look your best” is to spend hours and hours in the gym. This is VERY FAR from the truth! Personally, my favourite workouts are the ones that I can do outside in 30-40 minutes with very little equipment! Beach HIIT’s, Hotel HIIT’s, Sprinties at a local park, or HIIT cardio in my basement are GREAT ways to get the body burning and not spend your day in the gym! Don’t get me wrong, I do like going to the gym from time to time, but if I had my choice I’d be outside! With that said, I want to make it very clear that you absolutely DO NOT need a gym membership to reach your fitness goals or find success on your #90DayLeanPlan! Additionally, I wanted to point out a couple of benefits of NOT having a gym membership. Although there are definitely some benefits of going to the gym, (equipment being the main attraction) the monthly cost of a gym membership can be a significant commitment. Some high end gyms such as Equinox can end up costing $300-$400 dollars a month just to get in the door! Although the amenities are nice, there are many other more affordable gyms, such as Planet Fitness, Fit for Less, or even a local community centre, which are completely suitable options. Don’t let the cost of a gym membership deter you from starting your fitness journey. The reality is that you don’t need a fancy gym to take steps towards a healthier lifestyle. Any available space, a plan, and the right mindset can have your body burning in no time! Travel time to the gym can be an issue, especially for those of you who live in suburban areas. By the time you get in the car or bus and make your way to the gym, you could have had your whole workout done! Sometimes, even “the thought" of going to the gym is a deterrent, when “just starting” your workout would be much easier! Finally, “going to the gym” doesn’t guarantee you results! The gym isn’t for everyone, and there is nothing wrong with that! To see results, it is all about finding what works for you, and it doesn’t always include a gym. We’ve all had to ask that question! You walk into the gym, excited to get your leanercise in, but it turns out that every treadmill is taken, and there is 0 floor space! Depending on what gym you go to and when, sometimes it can be hard to find and use all the equipment (or simply floor space) you need for your workout. Especially at peak hours, such as the after work rush, the gym tends to get quite busy. When the gym is busy, it becomes more of a challenge to do a LEAN TAKEOVER or find the cardio machines you need! Sometimes, when the gym isn’t in the cards for us, weather it is because of dollars or distance, it is easy to use this as an excuse or a reason why you can’t workout and get lean. So when we are facing these issues with the gym, how do we get fit…? The answer is simple… WORKOUT FROM HOME!! Working out from home, just like the gym, isn’t for everyone, BUT it does have a ton of benefits! If you are a parent, you can workout while spending time with you kids. Even if you workout away from your kids, since you are home, you won’t have to worry about all the wasted travel time. Saving travel time is a benefit for anyone, with or without kids, especially if you are living in a suburban area and need to travel 10-20 minutes each way to the gym. Another great benefit of working from home is you don’t have to worry about a crowded gym, or not knowing if your favourite treadmill will be available! There are TONS of benefits of working out at home, and there are so many different body weight workouts you can do right from home! Like this 20 minute fat burning workout or this 12 minute AB and arm workout . My LATEST workout can be done from ANYWHERE and helps tone muscles, burn fat and increase fitness! Check it out on my Youtube channel. Check out These LEANMAZING at Home Results! There are a TON of people who have achieved amazing results from working out from home. The first example being ALYSHA BLAZEVIC! 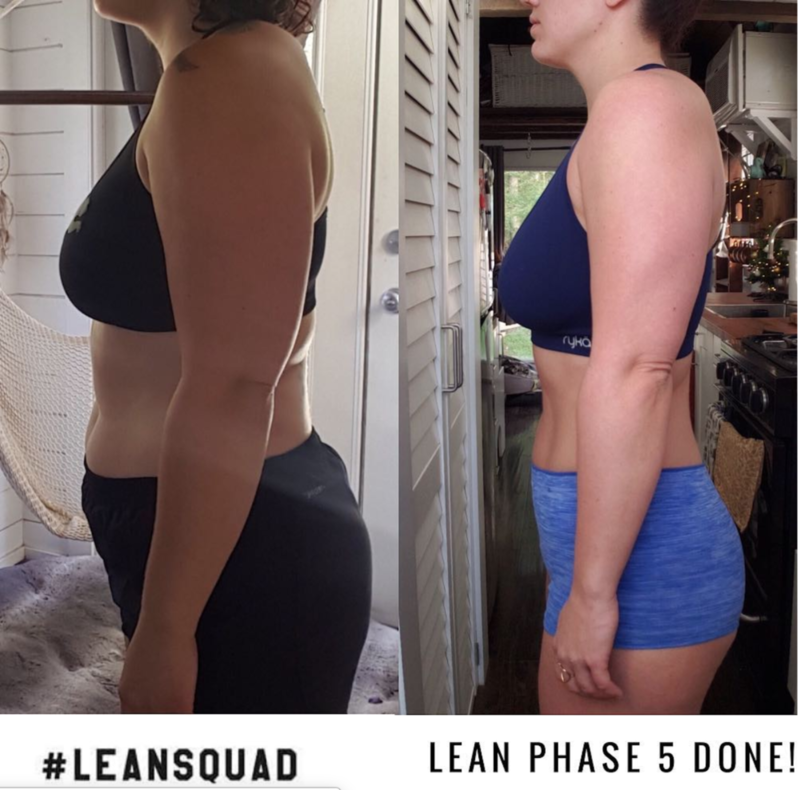 Alysha has seen leanmazing results after a short 4 MONTHS of being a part of the LEANSQUAD. As a mother of 2 Alysha decided to opt for all at home workouts so she could spend more time with her kids, and all her hard work paid off! Another Squadie who has achieved LEANSANE results is BRISTINE GIBBONS! Bristine not only completed all her workouts from home, but she also CRUSHED the #90DAYVEGANPLAN! Bristine has completed phase 9 of the lean plan and is looking LEAN-MAZING, WITHOUT having to go to the gym. There you have it Squadies! No matter where you are, whether you have access to a gym or not, you can GET LEAN, even from home!